Nadia Bjorlin wears a pair of exclusive Chanel 5080 sunglasses in Redline. In the action film Redline, Nadia Bjorlin wears a pair of Chanel 5080 sunglasses. These exclusive shades can clearly be spotted in the last scene of the movie, the race between her and Nathan Phillips (who wears Electric Livewire sunglasses) in the Koenigsegg CCX and the Ferrari Enzo supercars. The frame of the Chanel 5080 sunglasses is in a shiny black & baquelite and the lenses are grey (color code C501/87). 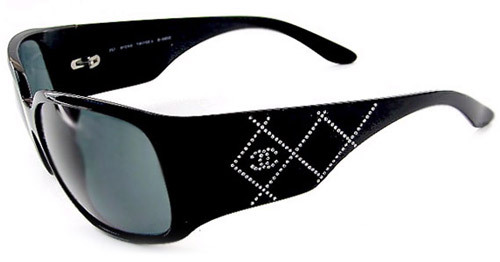 The temples have the famous quilted Chanel pattern and CC logos with chrystals. These sunglasses are quite exclusive, you can find them sometimes on eBay .